CNN’s commitment to unbiased coverage this 2012 election season will culminate Tuesday, Nov. 6, Election Day, with the network’s top team of anchors in Washington and in the field, from reporters on the ground in the final battleground states and at candidate headquarters. Anchors Wolf Blitzer and Anderson Cooper from Washington, with Candy Crowley from Boston and Erin Burnett from the hotly contested state of Ohio, will lead ‘Election Night in America’ coverage beginning at 6 p.m. CNN’s coverage will be the network’s first-ever Election Day anchored from Washington, where more than 40 consecutive hours of live programming are planned from the newly constructed, state-of-the-art studio and control room. Kicking off Election Day coverage live from Washington beginning at 5 a.m. will be Early Start with John Berman and Zoraida Sambolin and Starting Point with Soledad O’Brien. A full programming schedule for Election Day and the days surrounding is outlined below. National political reporter Jim Acosta will join Crowley in Boston at the Romney campaign headquarters, while White House correspondents Jessica Yellin, Dan Lothian and Brianna Keilar will be live from Obama campaign headquarters in Chicago. Chief national correspondent John King will be at the Magic Wall to provide analysis of CNN’s projections and explain closely contested races in county-by-county detail. Senior congressional correspondent Dana Bash will also join anchors in the studio to provide context as House and Senate races are projected. Correspondent Tom Foreman will appear live from the virtual studio in Washington to present a “Virtual Senate,” allowing viewers to visualize the balance of power in congress and to explain the consequences of a Democratic or Republican-controlled Senate. On hand throughout the evening and early morning hours to provide expert insight and analysis will be chief political analyst Gloria Borger and senior political analyst David Gergen. Joining coverage on Election Day and through the early morning hours will be the following voices with perspectives across the political spectrum: Paul Begala, James Carville, Alex Castellanos, Ari Fleisher, Margaret Hoover, Van Jones, Roland Martin and Ana Navarro. CNN Digital will have a robust and multiplatform experience with the latest results and analysis for the 2012 Election. The CNN.com Home Page will display top election news, interactive data, social integrations and real-time updates about the races. The latest results, polling (including exit polls for battleground states), live-blogging, candidate profiles and round-the-clock coverage will be available through CNN’s Election Center and via the CNN apps for iOS, Android and Windows Phone and optimized for all users of CNN’s mobile website. CNN Digital will live stream from the campaign headquarters in Boston and Chicago as well as all acceptance and concession speeches from key races, giving users a front-row seat through CNN’s mobile apps and at www.CNN.com/live. Users may also authenticate through their cable, satellite or telco providers to access CNN and HLN’s 24-7 television feeds via TV Everywhere. CNN’s Electoral Map and Calculator will identify battleground states and help users game out the presidential contest. Through Google and CNN’s Campaign Explorer, users can track ad spending, fundraising and travel in the presidential race. The Poll of Polls interactive will display poll results over time for the national horserace and in key battleground states. Finally, Facebook-CNN Election Insights will display dynamic, real-time charts and visualizations of Facebook activity on Election Night, which CNN will report throughout the evening. CNN iReport, the network’s global participatory news community, will invite voters across the country to be part of CNN’s election coverage by taking and sharing photos wearing their “I Voted” stickers. Users can join in through iReport or by using #IVotedCNN on Twitter and Instagram. After the election, CNN will also invite iReporters to share their reactions following the results. On Election Day, in addition to CNN’s daily political newsletter Gut Check, CNN’s live blog at CNN.com/Conversation will provide instant reaction and analysis from CNN’s anchors, reporters and more from influencers around social media. The companion to CNN’s TV coverage will also provide extra information, trivia, instant polls and viewer comments/questions. Furthering CNN’s election partnership with Facebook, users who have pledged to participate via CNN’s “I’m Voting” app will be able to take part in various election-related surveys powered directly on their computer, tablet or mobile device. Also, CNN.com will feature an interactive dashboard that provides real-time data about who on Facebook is talking about the candidates. Facebook will also provide exclusive insights to CNN on trending election-related keywords. The social networking site will also provide international data on which countries are buzzing most about the candidates. All data and results will be integrated in CNN’s cross platform programming on Election Day. On social media, CNN viewers are encouraged to visit CNNPolitics on Facebook, follow @CNNPolitics on Twitter and use the hashtag #CNNElections for the latest news and up to the minute updates about the election. GetGlue users can check-in to CNN’s ‘Election Night in America’ coverage for two exclusive limited-edition stickers. Users are also invited to go behind-the-scenes with CNN’s reporters, by viewing photo highlights from CNN Politics on Instagram. Users may also subscribe to CNN’s political teams for all of their latest updates across social media on Facebook and Twitter. Additionally, CNN is taking big stories and election related data and packaging them up in small snapshots created exclusively for Tumblr. The newly created Tumblr page, The CNN Brief includes shareable infographics (poll numbers, ad spending, historical facts) and visually displaying these data slices as animated GIFS and visual images. CNN en Español’s coverage will begin at 7 p.m. and will be moderated by the network’s senior political anchor Juan Carlos López along with anchors Patricia Janiot, Fernando del Rincón, Carmen Aristegui, Xavier Serbiá, Guillermo Arduino and Alejandra Oraa. CNN en Español will have correspondents reporting from all over the world talking with people about how the U.S. election and their candidates are viewed abroad, including Mexico, Cuba, Argentina, Colombia, Venezuela, Puerto Rico, Spain and Israel. The coverage will also include reporters throughout the U.S., including Ione Molinares reporting from the Obama campaign headquarters in Chicago, Adriana Hauser reporting from the Romney campaign headquarters in Boston, Maria Santana in New York, Karina Dalmas in Los Angeles, Rafael Fuenmayor in Miami and Gustavo Valdes, who is traveling with the CNN Election Express through Florida, North Carolina, Virginia and Ohio. CNN International will kick off its special coverage of the U.S. presidential election at 6 a.m. Tuesday from CNN’s world headquarters in Atlanta. Led by CNN’s Richard Quest, Hala Gorani, Isha Sesay and Jonathan Mann, CNNI will showcase the expertise of CNN correspondents across the U.S. and around the world, offering up-to-the-minute reaction from U.S. voters. At 9 a.m., CNNI will broadcast a special business-centered program featuring Quest and CNN’s chief business correspondent Ali Velshi, who will look at early reaction to the election from the world’s leading financial markets. And at 3 p.m., CNN’s chief international correspondent Christiane Amanpour will anchor a live U.S. election-edition of Amanpour. Following the broadcast of Amanpour, CNNI will join CNN/U.S. and continue simulcasting until 6 a.m. Wednesday. As on Election Day in 2008, CNN will again host a viewing party at the corner of 47th Street and Broadway in New York City. The event will be open to the public on a first-come, first-served basis to view the network’s election coverage. o The Situation Room with Wolf Blitzer airs live from 6 p.m. to 7 p.m.
o Romney Revealed: Family, Faith and the Road to Power airs from 8 p.m. to 9:30 p.m. and 11:00 p.m.
o Obama Revealed: The Man, The President airs from 9:30 p.m. to 11:00pm and 12:30am. o A special election edition of State of the Union with Candy Crowley airs live from 9 a.m. to 10 a.m.
o America’s Choice 2012: Countdown to Election Day lead by Wolf Blitzer, Anderson Cooper, Candy Crowley and John King airs live from 8 p.m. to 9 p.m.
o Piers Morgan Tonight airs live from 9 p.m. to 10 p.m.
o Early Start with John Berman and Zoraida Sambolin and Starting Point with Soledad O’Brien air live from 5 a.m. to 7 a.m. and 7 a.m. to 9 a.m., respectively, from Washington. o The Situation Room with Wolf Blitzer airs live from 4 p.m. to 7 p.m.
o Erin Burnett OutFront airs live from Columbus, Ohio, from 7 p.m. to 8 p.m.
o Anderson Cooper 360° airs live from 8 p.m. to 9 p.m. and 10 p.m. to 11 p.m. from Washington. o Erin Burnett OutFront airs live from Columbus, Ohio, from 11 p.m. to midnight. o Piers Morgan Tonight airs live from 9 p.m. to 10 p.m. and midnight to 1 a.m. from New York. o Early Start with John Berman and Zoraida Sambolin and Starting Point with Soledad O’Brien air live from Washington from 5 a.m. to 7 a.m. and 7 a.m. to 9 a.m., respectively. o Election Day in America editions of CNN Newsroom will provide live coverage from 9 a.m. to 2 p.m. with updates from CNN’s correspondents in the final battleground states. o A special one-hour Election Day in America edition of Erin Burnett OutFront airs live at 2 p.m. from Columbus, Ohio. 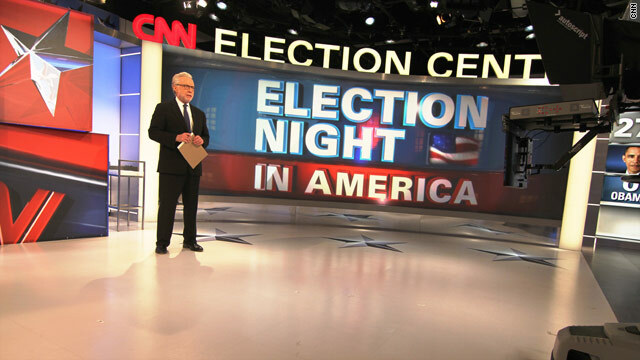 o A special one-hour Election Day in America edition of Anderson Cooper 360° airs live at 3 p.m. from Washington. o A special Election Day in America edition of The Situation Room with Wolf Blitzer airs live beginning at 4 p.m.
o ELECTION NIGHT IN AMERICA full team coverage begins at 6 p.m. and continues through night and early morning to 3 a.m.
o America’s Choice 2012 coverage will begin at 3 a.m. with Early Start anchors John Berman and Zoraida Sambolin and Starting Point anchor Soledad O’Brien. Sambolin will be live from Chicago, Berman and O’Brien are live from Washington. o At 9 a.m. America’s Choice 2012 continues with Kate Bolduan and Joe Johns from Washington. o At noon, post-election day editions of CNN Newsroom continue with anchors Wolf Blitzer, Suzanne Malveaux, John King and Brooke Baldwin from Washington and Atlanta. o Post-Election Day editions of The Situation Room with Wolf Blitzer, Erin Burnett OutFront, Anderson Cooper 360°, and Piers Morgan Tonight will air live at their regularly scheduled times. CNN Worldwide, a division of Turner Broadcasting System, Inc., a Time Warner Company, is the most trusted source for news and information. Its reach extends to nine cable and satellite television networks; one private place-based network; two radio networks; wireless devices around the world; CNN Digital Network, the No. 1 network of news Web sites in the United States; CNN Newsource, the world’s most extensively syndicated news service; and strategic international partnerships within both television and the digital media.